The Mars of ERB is a dying planet. 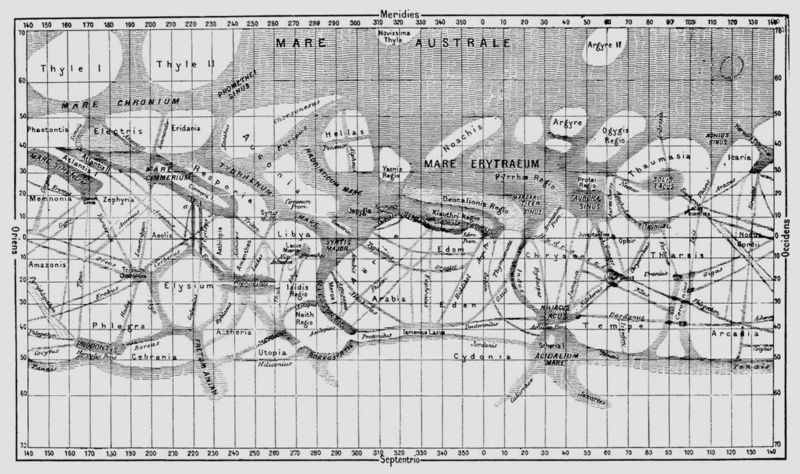 When the five oceans of Barsoom evaporated, life became impossible and only the innovations of Martian scientists made it possible for life to continue. 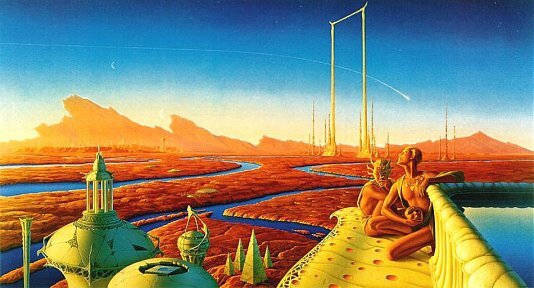 In light of global warming and climate change on today’s Earth, the story of ERB's Barsoom is more relevant than ever. How do intelligent beings cope when their extinction is imminent? 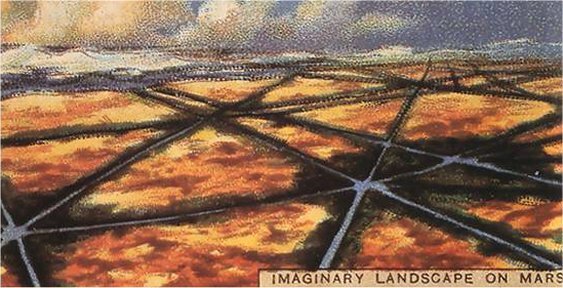 When ERB started his Martian series of books in 1911, the idea of Earth sharing the same fate someday must have been viewed as pure fantasy. Then came the atom bomb and evidence of collisions with meteors and comets, an idea first mocked as insane when proposed by Immanuel Velikovsky in his controversial Worlds in Collision published in 1950. Yes, the world has changed and ERB's Martian series is just as fun to read today as it was to the less scientific sophisticated folk of his day. As we bring the Seven Wonders of Barsoom series to a close, it is no wonder that the Life-Saving Pumping Stations should receive the premier spot. A. The Water Pumping Stations of Barsoom. “Xodar was at my side as I stood looking out over the ship's rail. “‘What course?’ I asked him. “As I looked I commenced to realize why it was that in all the ages only one had escaped from the Valley Dor. My only wonder was that even the one had been successful. To cross this frozen, wind-swept waste of bleak ice alone and on foot would be impossible. “‘Only by air boat could the journey be made,’ I finished aloud. “‘It was thus that one did escape the therns in bygone times; but none has ever escaped the First Born,’ said Xodar, with a touch of pride in his voice. “We had now reached the southernmost extremity of the great ice barrier. It ended abruptly in a sheer wall thousands of feet high at the base of which stretched a level valley, broken here and there by low rolling hills and little clumps of forest, and with tiny rivers formed by the melting of the ice barrier at its base. Many artistic depictions of this area appear in wonderful maps that can be viewed at ERBzine #2807. They then view a village in the valley which Xodar explains is a village of lost souls, neutral ground where pilgrims to the Valley Dor reside who have lost their nerve and fearful of the fate they face if they return to their homes. Other inhabitants are slaves who have escaped from the therns. “As we neared the dark, truncated cone the vessel’s speed was diminished until we barely moved. Then we topped the crest of the mountain and below us I saw yawning the mouth of a huge circular well, the bottom of which was lost in inky blackness. “The diameter of this enormous pit was fully a thousand feet. The walls were smooth and appeared to be composed of a black, basaltic rock. “For a moment the vessel hovered motionless directly above the center of the gaping void, then slowly she began to settle into the black chasm. Lower and lower she sank until as darkness enveloped us her lights were thrown on and in the dim halo of her own radiance the monster battleship dropped on and on down into what seemed to be the very bowels of Barsoom. They land on the water after the ship changes from air to water propellers and Carter and Phaidor marvel at all of the ships, mainly war ships, floating on the underground sea. “‘Here is the harbour of the navy of the First Born,’ said a voice behind us, and turning we saw Xodar watching us with an amused smile on his lips. “A new light burst on me with this explanation. The red men had always considered it a miracle that caused great columns of water to spurt from the solid rock of their reservoir sides to increase the supply of the precious liquid which is so scarce in the outer world of Mars. “As we were about to leave the pool and enter the corridors, an officer called my attention to the waters upon which the submarine floated. At first they seemed to be merely agitated as from the movement of some great body beneath, and I at once conjectured that another submarine was rising to the surface in pursuit of us; but presently it became apparent that the level of the waters was rising, not with extreme rapidity, but very surely, and that soon they would overflow the sides of the pool and submerge the floor of the chamber. “For a moment I did not fully grasp the terrible import of the slowly rising water. It was Carthoris who realized the full meaning of the thing – its cause and the reason for it. After many harrowing episodes, they make it to the upper levels and bring the reign of Issus and the First Born to an end. But what happens to the water at the South Pole that the First Born pump to the outside world? 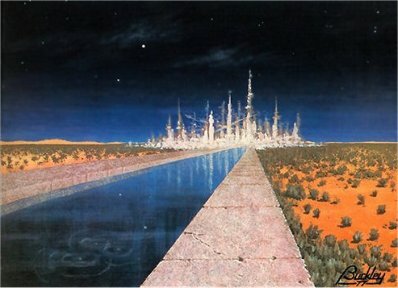 “The water which supplies the farms of Mars is collected in immense underground reservoirs at either pole from the melting ice caps, and pumped through long conduits to the various populated centers. Along either side of these conduits, and extending their entire length, lie the cultivated districts. These are divided into tracts of about the same size, each tract being under the supervision of one or more government officers. 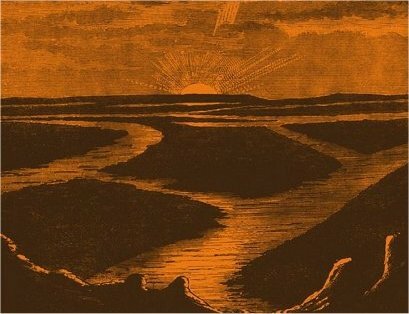 “‘They had reached the ultimate pinnacle of civilization and perfection when the first shadow of impending fate darkened their horizon – the seas began to recede, the atmosphere to grow more tenuous. What science had long predicted was coming to pass – a world was dying. “‘For ages our cities followed the receding waters. Straits and bays, canals and lakes dried up. Prosperous seaports became deserted inland cities. Famine came. Hungry hordes made war upon the more fortunate. The growing hordes of wild green men overran what had once been fertile farm land, preying upon all. “At daybreak of the fifteenth day of my search I was overjoyed to see the high trees that denoted the object of my search. About noon I dragged myself wearily to the portals of a huge building which covered perhaps four square miles and towered two hundred feet in the air. It showed no aperture in the mighty walls other than the tiny door at which I sank exhausted, nor was there any sign of life about it. Carter explains his situation to the voice, who is suspicious because Carter is so different from any other race of men on Barsoom. Carter tells him he is a friend of the red men and is starving to death. “Presently the door commenced to recede before me until it had sunk into the wall fifty feet, and then it stopped and slid easily to the left, exposing a short, narrow corridor of concrete, at the further end of which was another door, similar in every respect to the one I had just passed. No one was in sight, yet immediately we passed the first door it slid gently into place behind us and receded rapidly to its original position in the front wall of the building. As the door had slipped aside I had noted its great thickness, fully twenty feet, and as it reached its place once more after closing behind us, great cylindars of steel had dropped from the ceiling behind it and fitted their lower ends into apertures countersunk in the floor. 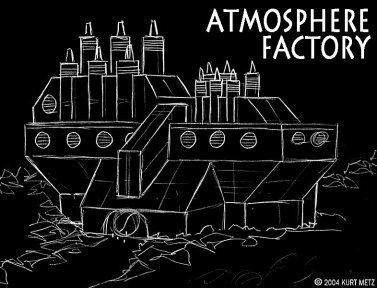 Because Carter has the ability to read the unguarded Martian mind with no Martian capable of his reading his own, he learns a lot more about the atmosphere factory than the old man would have otherwise allowed. “The building in which I found myself contained the machinery which produces the artificial atmosphere which sustains life on Mars. 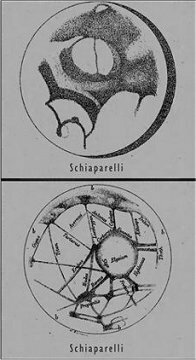 The secret of the entire process hinges on the use of the ninth ray, one of the beautiful scintillations which I had noted emanating from the great stone in my host’s diadem. “This ray is separated from the other rays of the sun by means of finely adjusted instruments placed upon the roof of the huge building, three-quarters of which is used for reservoirs in which the ninth ray is stored. This product is then treated electrically, or rather certain proportions of refined electrical vibrations are incorporated with it, and the result is then pumped to the five principal air centers of the planet where, as it is released, contact with the ether of space transforms it into atmosphere. “There is always sufficient reserve of the ninth ray stored in the great building to maintain the present Martian atmosphere for a thousand years, and the only fear, as my new friend told me, was that some accident might befall the pumping apparatus. Carter discovers that every Martian as a child learns the principles of the manufacture of atmosphere but only two men hold the secret of ingress into the building. The factory is virtually unassailable with walls a hundred and fifty feet thick and the roof is guarded from air assault by a glass covering five feet thick. The only fear is of some demented person or by an attack by the green men, for all Barsoomians realize that their very existence hinges on the survival of the factory. From then on the old man supects that he has given the secret away to Carter and resolves to kill Carter while he is sleeping to make sure the secret stays safe. However, Carter reads the old man's mind and escapes with Woola using the nine Martian sounds. This knowledge eventually helps Carter to save the planet when the old man and his assistant mysteriously die. “An hour before dark the great walls of the atmosphere plant loomed suddenly before me, and with a sickening thud, I plunged to the ground before the small door which was withholding the spark of life from the inhabitants of an entire planet. “Beside the door a great crew of men had been laboring to pierce the wall, but they had scarcely scratched the flint-like surface, and now most of them lay in the last sleep from which not even air would awaken them. “Conditions seemed much worse here than at Helium, and it was with difficulty that I breathed at all. There were a few men still conscious, and to one of these I spoke. “‘If I can open these doors is there a man who can start the engines?’ I asked. “I had no time to talk, I was becoming very weak and it was with difficulty that I controlled my mind at all. “But, with a final effort, as I sank weakly to my knees I hurled the nine thought waves at that awful thing before me. The Martian had crawled to my side and with staring eyes fixed on the single panel before us we waited in the silence of death. “Slowly, the mighty door receded before us. I attempted to rise and follow it but I was too weak. Carter is then astrally projected back to the Arizona cave where his adventure began and is unable to return to Mars for ten years to see if the man made it to the pumps. I recall dreaming that I would be the first man on the moon. That was in 1957. Imagine how the Martian series must have appeared to the average educated reader in 1912 when A Princess of Mars was first published. And yet it only took twelve years since I dreamed of being the first man on the moon for Neil Armstrong to beat me to it. I also have a theory of who killed the caretaker of the atmosphere plant and his assistant, which I think makes sense as our own world faces some of the greatest challenges to its water supply and atmosphere. I think after eight hundred years living in isolation that the old man became so paranoid that he went mad and decided to take the whole planet with him in a mass suicide. I see the same kind of madness today with the disaster in the Gulf of Mexico and an incredible amount of people actually entertaining the possibility that the world will come to an end on December 21, 2012. I don't know about you, but I intend on waking up on December 22, 2012, with a hangover and a beautiful woman who thought she would go out with a bang. Hopefully, there are still some Orovars among us that will save our lovely paradise from ending up like Barsoom. ERB sure gave us something to think about. 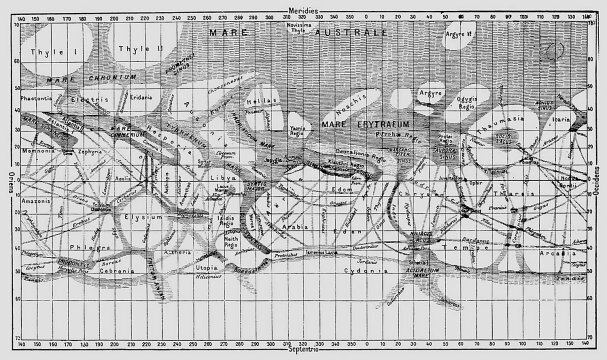 ERB's Life-Saving Pumping Stations of Mars: The First Wonder of Barsoom! 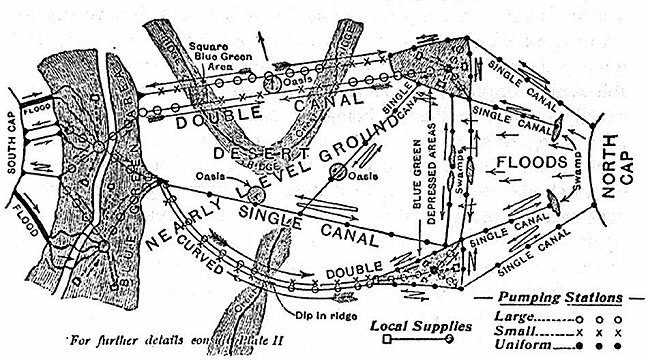 the network of channels, complete with dams and pumping stations.